Car seats are probably one of the most important purchases you’ll make for your child. From the initial baby seat all the way up to the boosters when they are older. Kai came home at fourteen months so we missed that back facing, baby seat phase and were straight onto the six months to three years seat. But Kai is now a big boy, weighing almost 15kg, we needed some new seats. We have two cars and thought we’d go with different styles for each. My husband went for the classic Evolva in red as he has a smaller car. This has been a favourite amongst parents for over ten years and it’s recently had a little style upgrade and is available in lots of colours. Fitted via ISOfix or through the standard three point seatbelt alone it works for most cars. I went for the Kidfix III M, part of the Britax Romer Premium Line. I just love the navy colour if I'm being honest! It’s ergonomic design also gives your child greater comfort which is great for those longer journeys. It has a longer seating area which will be great as Kai gets bigger and taller. There is also a V-shaped backrest which grows with your child, offering a more comfortable fit for smaller kids and then opening up to give more space as they grow. It also comes with the Advanced Side Impact Protection functionality. The Kidfix car seat is a little different where you use the main three point car seat belt to secure the child in the seat. This was new for me so I was a little unsure. Is this safe enough? The chair isn’t ISOfixed in so would it be safe enough? But after rigorously checking and checking... and checking again, it's in there safe and sound. One thing you might need to do is fasten the seatbelt around the car seat when driving without your child because if it's not strapped in using the three point seatbelt, it's basically loose and can move about the car (I actually didn't fasten it in one day and it stayed put but would probably move about the back with lots of roundabouts). All Britax Romer seats come with ample instructions and they are surprisingly easy to get your head around. I guess once you’ve had a car seat you just know the gist. But these seats not only look good but honestly feel good too. Sturdy, solid… you can tell they produce good quality seats. What literally terrified me recently was when Kai started opening the buckle on his car seat. He’s four now, he knows how to do it and he has the strength! 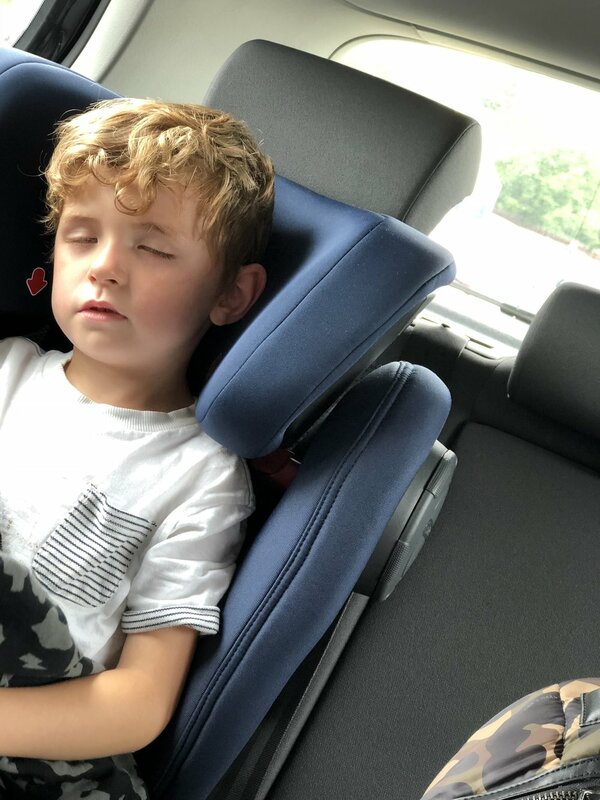 So having the Kidfix seat eases that worry as it’s all held in by the main three point seatbelt of the car which he currently can't reach when strapped in the seat. They also come with removable covers which is ESSENTIAL… they get full of crumbs, sand and god knows what! You can check out these seats, and plenty more options, over at Britax Romer. They even have a car checker to see if the seat you like is compatible with your car! Happy driving! I received the two car seats from Britax Romer to then review. All opinions are my own.